Saturday, April 30th Zakat Foundation of America (ZF) participated in the Global Activism Expo hosted by National Public Radio’s (NPR) local affiliate WBEZ. The Global Activism Expo is an annual tradition for ZF as the team meets with other organizations that make a positive imprint on the global community. Organizations are given displays to showcase the work they do but also give organizations an opportunity to share ideas on how to innovate and sustain their efforts. ZF garnered great attention from fellow activists as well as fans of NPR. Many were impressed on the scale of work as it stretches on nearly every continent from seasonal programs to sustainable development projects. Volunteers felt proud to represent an organization that impacts communities in a way that’s sensitive to their needs and strives to improve the quality of individual lives as well as the communities they belong to. To be separated by thousands of miles from a community and yet to be so keen on what the community needs instead of what we as observers think they need shows true humility and respect for those communities. 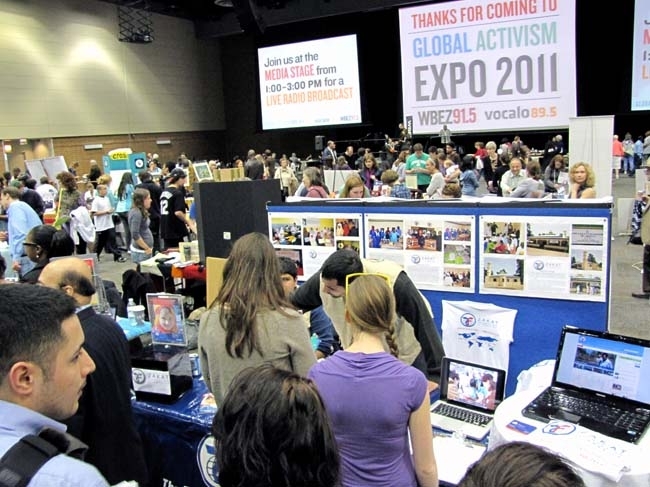 ZF thanks WBEZ for hosting the Global Activism Expo because its gives organizations of all levels of development the opportunity to cultivate their ideas and reaffirm their vision on how to impact the world one community at a time.